What Does the Term “Rough In” Mean? “Rough In” is construction terminology for a specific phase of a home building or renovation project. At this point, holes have been made, studs have been fitted, plumbing framework is assembled, but fixtures haven’t been installed. You may be asking why roughing in is important. 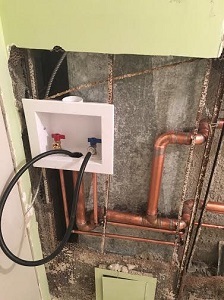 All plumbing feature have to be placed certain distances apart in order for a building to be up to code. Ignoring building codes means that you have a very expensive problem to fix later on. You may incur fines, and forced to correct the plumbing by the City of Ottawa at your own expense. Depending on how many modifications you’ll need to make, it may be more than the initial cost of the renovations. Roughing in allows us to ensure we have laid out our framework correctly. It verifies that we have enough room to meet building codes, and have a plumbing feature be functioning properly. We can use it to confirm that pipes and drains are located where they’re supposed to be. When we get roughing in right the first time, we eliminate the need for time and money to redo it later. It’s best if you have a licensed plumbing team, like Dr. Pipe Drain and Plumbing Services, assist you with your roughing in. Performing this as a DIY project is may result with you frustrated and making many expensive mistakes. Poor roughing in can lead to clogged drains, improperly flushing toilets, and bad water flow through pipes which may lead to backups. Our 20+ years of experience working with local plumbing and venting codes will be an asset for you project. We can help design a roughing in which meets all necessary requirements. yours and the City of Ottawa’s. Recommendations for proper maintenance, and warranties for the job. Our strengths do not only lie in plumbing. We can also help navigating the insurance companies and bureaucratic red tape. You will receive all the necessary permits for our jobs. We will guide you through the City of Ottawa rebates for which you qualify. Our customers love us, and our work is the best quality. Stop by our testimonials page, and then give us a call. We’ll set up your free, no-obligation quote for roughing in.